Dryopteris cristata.commons.wikipedia. org (Accessed 3/2014). Dryopteris cristata is a fern from the end of a short, creeping rhizome. Leaves evergreen, 35-80 cm long, in rosettes, stalk and midrib brown-scaly; blades twice pinnate and pinnately lobed, to three times pinnate, narrow; with 10-25 pinnate leaflets (pinnae) per side, leaflets 5-9 cm long, 3-4 cm wide, widest just above base, firm, bluish-green, tilted towards the horizontal plane, lower leaflets widely spaced, broadly triangular about 2.5 cm long, horizontal, upper leaflets more elongate and crowded, secondary leaflets about 6 per side, oblong, tips blunt, margins toothed; fertile blades deciduous. Spore cases round, midway between midvein and margin (Cobb 1963). Habitat: Wet to moist forest understory. Notes: A host of the white-spored fir rust fungi: Milesina fructuosa, M. marginalis, and Uredinopsis atkinsonii (a fir-fern rust, Basidiomycotina) (Sinclair et al. 1987). 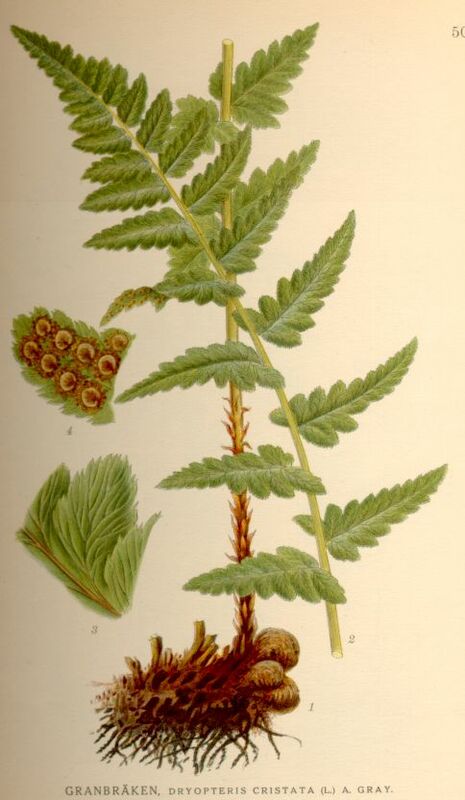 The closely related, shade tolerant, semi-evergreen fern, D. marginalis (which has not been found in NYC since before 1980) has a leaf life span of 30 weeks. It requires at least 0.2% sunlight in order to survive (compensation point), but cannot use more than 3.0% full sunlight (saturation point) (Hicks and Chabot 1985).